Clyde Clemett: Experienced teacher and musician from Wellington New Zealand, Clyde was on the judging panel of the 2014 and 2016 New Zealand Classical Guitar Competition. He studied at the Wellington Conservatorium of Music under Matthew Marshall and performed throughout New Zealand as a soloist and member of the Wellington Guitar Quartet, for many years. He is now the musical director and regular performer with the chamber-pop group Sven Olsen's Brutal Canadian Love Saga. He has been teaching guitar in the Wellington Region for over thirty five years. Competition Guidelines: The NZCG Competition is an international competition, no entry restrictions other than the age requirements indicated below. • Entries accepted up until Friday 23rd of November. Cancellations will not be refunded. • The competition reserves the right to video record the final round for publicity purposes. Dec 7th Friday 6.45pm Competitors meeting: all competitors to meet in the Adam Concert Room foyer to hand in copies of scores and take a tour of venue and warm-up rooms. Playing order for the first rounds will be announced. Dec 9th 7pm Audio visual recording of prize winning New Zealand pieces. 1012 East Coast Rd., Fairveiw Heights, Auckland. Adults $30, Child/student $15, Concession $25. ​Wine, juice and tapas included. Please R.S.V.P with Rod on 473-2226. C.D's will be on sale at concert. colourful and varied performance . The programme will include classical works such as three Spanish Dances by Granados, Tangos by Argentine Composer Astor Piazzolla , jazz, gypsy, solo flamenco guitar, and a new original composition titled La Loba. Other tours this year have taken the Duo to Westland and to Singapore. MARGARET began her violin studies at the age of seven in Dunedin. In 1972 she was accepted to study with Glynne Adams at Auckland University. Further study continued with the great Czech teacher Jan Sedivka at the Tasmanian Conservatorium of Music, resulting in invitations to tour in Australia. 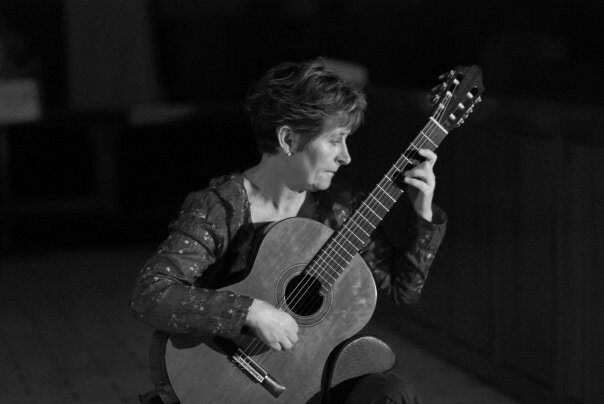 Margaret has a natural ability to convey the subtleties and virtuosity of the classics, to captivate the soul with gypsy music, and to improvise with natural creative flair in jazz idioms. Four years of advanced and intensive study at Canterbury University under Polish Master Jan Tawroszewicz have resulted in an impressive technique and profound musical sensitivity. MILES began his musical training on the violin, changing to classical guitar in 1965. He has studied with a number of distinguished teachers, and several periods in Spain have allowed him to explore and develop Flamenco techniques. An intense period of study with world-renowned Czech guitarist Vladimir Mikulka took place in the summer of 1982. This was followed with three years of study with the English master guitarist John Mills, which has provided Miles with a technical facility and musicianship of the highest standard. ​DUO JACKSON are unique: classical guitar and violin are an unusual combination of strings. The diverse range of music styles featured in the duo’s repertoire; classical, jazz, latin, flamenco, gypsy, original compositions and the authenticity of their performance, creates a unique musical flavour and style. Margaret and Miles have performed in many countries and extensively throughout Australasia. They have made a number of programmes for radio and television and have made many recordings. Over forty five years of performance and life together have formed a rapport, which is enchanting to experience. Margaret and Miles live in Nelson and both teach at the Nelson School of Music. Their own compositions which have a very original style, usually feature in their performances and have been extremely well received. They have given special performances for the New Zealand Embassies in Singapore and Spain and their last international tour was in 2015 with concerts in Singapore, France, Spain and Italy. R.S.V.P with Rod on 473-2226. The Wellington Guitar Duo was formed in 2016 by Emma Sandford and Joel Baldwin as part of the chamber music programme at the New Zealand School of Music. A like-minded focus and friendship has widened the scope of the duo to extend beyond the conservatory into a more professional sphere. They share a wide range of guitar duet literature of both historic and contemporary music and ​look to the future to expand the repertoire for the ensemble. Both members were taught by Auckland teacher, John Wakelin before being accepted into the classical guitar performance programme in 2014 under the tutelage of Dr. Jane Curry. Emma is in the process of completing a major in composition in addition to her guitar studies. Inspired by her father, she began classical lessons at age 11 which soon became her passion. Emma’s interest in composition has led her to write for various ensembles and solo instruments, including the guitar. She is also interested in teaching and is a Suzuki method teacher in training. Emma received fourth place in the Biennial New Zealand Classical Guitar Competition in 2016. Joel is a software engineer turned classical guitarist. Though his focus is on music of the 17th and 18th centuries, he is also at home interpreting works of the 20th century. He gave his solo debut as part of the Jack Richards concert series in Gisborne, 2016 and received third place in the Biennial New Zealand Classical Guitar Competition in 2016. Adults $30, Child/student $15, Consession $25. Zealand’s foremost classical guitarists. He is an alumni of the University of Auckland School of Music, graduating with honours in 1995. Bruce is an auditioned Concert Radio recording artist and was a semi-finalist in the 1995 Shell Darwin International Guitar Festival Competition. Highlights of his career were 1998 performances in Prague and Opočno with world famous Czech guitar virtuoso Štěpán Rak. This association strengthened a fascination for composing and in 2007 Bruce set about writing his first guitar compositions including ‘Finchdean’, a piece now popular with student and professional players alike. In 2009, original works released on his CD Lateral Lines were described by Wellington based guitarist Gunter Herbig, as “a wonderful achievement and a milestone for New Zealand guitar composition.” Bruce’s compositions have to date covered themes as diverse as New Zealand landscape, underwater sea life, songs of Gallipoli and kinetic art sculptures. In addition to guitar solos - including several specially composed for a DVD about the historic homestead Alberton - Bruce has written for two guitars, voice and guitar, viola and guitar and guitar quartet. of 16, also studying privately with John Williams in London. She went on to win two prestigious International Guitar Competitions at the age of 20, including the ‘Michele Pitaluga’ competition, Italy. Cheryl became widely acclaimed for her exquisite and delicate performances of Spanish music, including her performance of Sevilla on BBC’s ‘Masterclass’ series with Julian Bream and a Bach Fugue with Bream on French TV. These broadcasts areavailable to view on You Tube. Cheryl toured as a soloist for many years, giving the premier performance of Wilfred Joseph’s ‘Saratoga’ concerto for guitar, harp and harpsichord at the Qeen Elizabeth Hall in London. In 1997 Cheryl emigrated to NZ with her young family, releasing 3 CD’s - her solo album ‘Un Sueno en la Floresta’ is also available on iTunes. In 2014 she returned to the International stage giving a highly acclaimed tour of Canada and the UK. does not require amplification. He has appeared with orchestras in more that 30 countries, including Tonhalle-Orchestra Zürich, Bergen Philharmonic,Bournmouth Symphony, Danish National Symphony, Orchestra National de Lyon, Israel Philharmonic and, in North America, with New York and Los Angeles Philharmonics, Boston, Houston, Cincinnati, Oregon, Pittsburgh and Toronto Symphonies. He enjoys fruitful collaborations with conductors Giancarlo Guerrero, Miguel Harth-Bedoya, Carlos Kalmar, Helmut Lachenmann, Juanjo Mena, Alondra de la Parra, composer George Crumb and the late Frühbeck de Burgos. in recital, he has appeared at Carnegie Hall, Puerto Rico's Festival Casals and Italy's Merano Festival, as well as in duet with violinist Augustin Hadelich at Ohio's Linton Music Series and at Rheingau Musik-Festival. The Aorangi Symphony Orchestra returns with a stunning Valentine’s Day programme, featuring the classical guitar and voice. Soloists are Elizabeth Mandeno (Villa-Lobos: “Bachianas Brasileiras No.5”), John Couch (Villa-Lobos: “Concerto for Guitar and Small Orchestra”) and Jane Curry (Rodrigo: “Concierto de Aranjuez for Guitar and Orchestra”). The concert opens with the Villa-Lobos Guitar Preludes Nos. 1 and 4, beginning what promises to be an evening of summer delights.